Megatibicen cultriformis (Davis, 1915), aka the Grand Western Flood Plain Cicada, is large cicada found in the states Arizona and New Mexico in the U.S. and in Mexico. According to the Biogeography of the Cicadas (Hemiptera: Cicadidae) of North America, North of Mexico by Allen F. Sanborn and Polly K. Phillips, it is found in the Mexican Highland Section of the Basin and Range Province of the Sonoran Desert, and is associated with cottonwood and willow trees1. Over the weekend, cicada collector Richard Newfrock emailed me some cicada photos for identification. Amongst those photos was what appears to be Megatibicen cultriformis labeled Escondido, Cal[iforia]. I asked Richard about the location, and sure enough, he said they were found in a pool in Escondido. I double-checked the species and location with top-tier cicada experts Jeffery Cole and David Marshall. From our conversation, I believe they agreed that the cicadas appeared to be M. cultriformis and that Escondido is far from its normal range (about 400 miles away). Female (left), Male (right). Found floating in a pool. So, how did these cicadas Megatibicen cultriformis end up in Escondido? More than likely, if they are truly M. cultriformis, they hitchhiked on a tree transported from Arizona to California — or as David Marshall said to me in an email, “it’s at least possible that cultriformis could have been introduced on the roots of saplings transplanted from Arizona”. 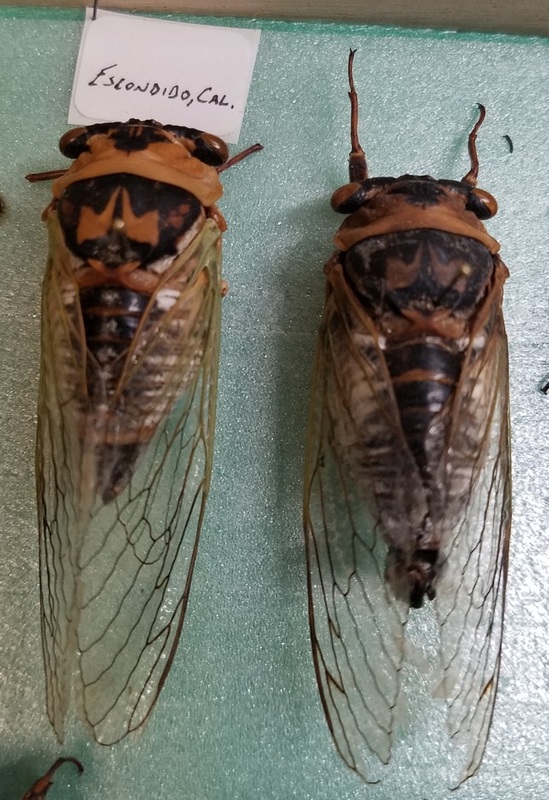 Does anyone in the Escondido area want to listen for these cicadas in the summer and report back to us if you hear them? Resembles Cicada marginata Say [now called Megatibicen pronotalis walkeri Metcalf, 1955] in size, color, and markings. Head black with an oblong greenish yellow spot each side between the eyes and a small spot of the same color on the front just above the transverse rugae. Pronotum greenish yellow with a large, conspicuous black spot occupying the fore part of its central area. The hind margin of the pronotum (collar) is entirely unicolorous as in marginata. The mesonotum is black, with a pruinose band each side at the base of the wings; the elevated x is greenish yellow, and there are two conspicuous, irregularly formed (pipe-shaped) greenish yellow spots occupying its central portion. The tergum is black, each side broadly margined with pruinose, and the segments have their posterior margins yellowish. There is also an indication of a dorsal line of pruinose spots on the tergum, which in the type have been nearly worn off. Beneath the head is blackish, the remainder of the insect being greenish yellow and more or less pruinose. The costal margin of the fore wing is entirely greenish yellow, darkened beyond the middle, and the w-mark is inconspicuous. Both fore and hind wings are greenish-yellow at base, with the veins darkened beyond the middle. Note that greens often fade to tannish colors after a cicada dies. Trivia: In Latin, “cultr” means knife, and “form” means shape — cultriformis means knife-shaped. Davis named cultriformis because “uncus locks, which are s millimeters long in cultriformis, and when seen in profile are shaped like the blade of a pruning knife, hence the name.” The uncus is the male genitalia. Location and habitat info: Biogeography of the Cicadas (Hemiptera: Cicadidae) of North America, North of Mexico by Allen F. Sanborn and Polly K. Phillips. Diversity 2013, 5, 166-239. A New Cicada from Arizona. Davis, William T. 1915. Journal of the New York Entomological Society. Vol 23. Pages 239-241.Read it on biodiversitylibrary.org. Megatibicen resh (formerly Neotibicen resh and Tibicen resh) is commonly known as the Resh Cicada because the markings on its back resemble the Hebrew symbol Resh “ר”. The Resh Cicada has been documented to be found in Arkansas, Kansas, Lousiana, Mississippi, Nebraska, Oklahoma, South Carolina, Tennesee, and Texas. Most people will discover them by finding their exuvia (shed skins, “shells”) on trees, or by their striking calls at sunset. I first encountered this cicada in Dallas, Texas near Pioneer Plaza (cattle sculptures). First I found the exuvia on oak trees (I needed a 3′ stick added to my 8′ reach to knock them down), and then at sunset I heard their call (which I mistook for M. auletes (which is not in Texas)). Listen to their song. It is one of the smaller Megatibicen — maybe only M. dealbatus is smaller. Compare sizes using this image by Kathy Hill. Its compound eyes are gray-beige, with a black “mask” between the eyes, and its simple eyes are pink. Its ventral side is white and caramel colored. Its dorsal side is dominated by a light green color, with black, brown and white — forming a symmetrical camouflage pattern — which helps to hide the cicada in its arboreal habitat. Recently molted, golden pruinose shimmers on its head, pronotum, mesonotum, and abdomen. During the molting process, up until the cicada’s body sclerotizes (hardens), the cicada’s body is leaf-green (camouflaged like a hanging leaf). The exuvia of the Resh cicada is large and easy to spot, even high up in trees. 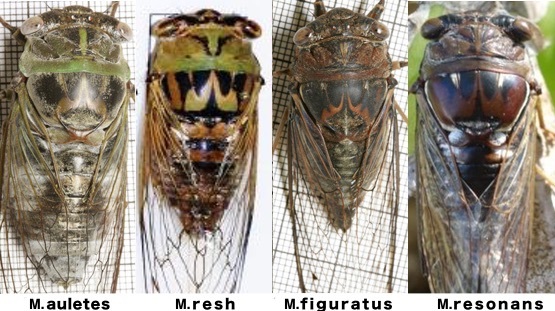 Even though molted adults are closer in size to N. tibicen than M. auletes, the exuvia of M. resh is comparable to M. auletes, which is the largest cicada in North America. Update: The hearing on the development of this property is May 14 at 7 p.m. but researchers can write testimony now and send it to Wallingford Planning and Zoning Commission, Wallingford Town Hall, 45 S. Main St., Wallingford, CT 06492. Anytime we remove trees, we reduce cicada habitat. Remove a small forest of trees and we might destroy the habitat for an entire species. North American cicada species need trees to survive and live out their life cycles, and certain cicada species require specific types of trees and specific environmental conditions. This is the case for Megatibicen auletes, also known as the Northern Dusk Singing Cicada, which prefers oak trees growing in sandy soil. Megatibicen auletes habitat is in peril in Wallingford, Connecticut, where a rare sandplain is about to be excavated and turned into space for a warehouse. Read this article: Environmental concerns prompt questions of state oversight in Wallingford. After reading the article, it seems like there is still a chance to reverse plans to develop this area. I hope it does not happen, for the sake of the cicadas. Megatibicen auletes is the largest cicada in North America. You can hear its remarkable call right after sunset in late summer months. I wonder how many residents of the Wallingford area knew that the largest cicada in North America lived in their community. I wonder how many people have heard the auletes’ scream right after sunset and wondered what creature made that sound. Hopefully, people will have another chance to hear them this summer, rather than the sounds of machines grinding up a forest, or the silence of yet another warehouse parking lot. Dusk is the time of day between sunset and night. Many species of Megatibicen & Neotibicen (formerly Tibicen) sing at this time. I’m not sure why they sing at this time — perhaps it helps them avoid audio competition with other singing insects, or perhaps it helps them avoid predators by calling at this specific time of the day. Megatibicen are LARGE and LOUD cicadas. Megatibicen auletes aka the Northern Dusk Singing Cicada. This cicada can be found in these states: AL, AR, CT, DE, DC, FL, GA, IL, IN, IA, KS, KY, LA, MD, MA, MI, MS, MO, NE, NJ, NY, NC, OH, OK, PA, SC, TN, TX, VA, WV, WI. Season: July to Fall. Megatibicen figuratus aka the Fall Southeastern Dusk-singing Cicada. Found in: AL, AR, FL, GA, LA, MS, NC, SC, TN, TX, VA. Season: July to Fall. Megatibicen resh aka Resh Cicada aka Western Dusk Singing Cicada. Found in: AR, KS, LA, MS, NE, OK, SC, TN, TX. Season: July to Fall. Megatibicen resonans aka Southern Resonant/Great Pine Barrens Cicada aka Southern Dusk Singing Cicada. Found in AL, FL, GA, LA, MS, NC, SC, TN, TX, VA. Season: July to Fall. Medium-sized, green cicadas with calls that sound like the rhythmic grinding of a scissor on a sharpening wheel (not a common tool in the 21st century). Neotibicen pruinosus pruinosus aka Scissor(s) Grinder. Found in AL, AR, CO, IL, IN, IA, KS, KY, LA, MI, MN, MS, MO, NE, OH, OK, SC, SD, TN, TX, VA, WV, WI. Season: June – September. Neotibicen pruinosus fulvus aka Pale Scissor(s) Grinder Cicada. Found in: KS, OK. Season: June – September. Neotibicen winnemanna aka Eastern Scissor(s) Grinder. Found in AL, DE, DC, GA, KY, LA, MD, MS, NC, NJ, PA, SC, TN, TX, VA, WV. Season: June – Fall. *Audio files are Copyright of InsectSingers.com. Season information gathered from BugGuide.net. A new species of Megatibicen, named Megatibicen harenosus sp. n., has been described by Jeffrey A. Cole. It lives in the Mescalero-Monahans shinnery sands areas of New Mexico and Texas. It is very similar to Megatibicen (Neotibicen, Tibicen) tremulus, which itself looks a lot like dorsatus and dealbatus. Megatibicen harenosus sp. n. is described from the Mescalero-Monahans shinnery sands of New Mexico and Texas, U.S.A. The new species is diagnosed from similar species, especially M. tremulus which it resembles closely, by male genital morphology, color pattern, calling song, and ecology. Seven characters from the male calling song are described from analysis of field recordings, of which all four temporal song characters are significantly different from M. tremulus. With one of the most southwestern distribution of any Megatibicen species, M. harenosus is a new addition to the rich, endemic, and understudied Mescalero-Monahans shinnery sands biota. The possibility that M. harenosus and M. tremulus are sister species is raised. The ecological, biological, and evolutionary species concepts support species status for M. harenosus, and an hypothesis of peripatric speciation in peripheral isolation is advanced. There is a sample of this cicada’s song on the Insect Singers website. Check it out. For some reason I associate “Giga” with “Gigabytes” and storage media like Flash drives, which explains this joke image. Over the past two years there have been quite a few updates to the genera of the cicadas that were organized under the Tibicen genus earlier this decade. The most recent paper by Young June Lee introduces the genera Gigatibicen, Ameritibicen, and Paratibicen 1. Earlier this year there was a paper by Allen Sanborn and Maxine Heath that introduced the genus Megatibicen 3, and in 2015 there was a paper by Kathy Hill and others that introduced Neotibicen and Hadoa 2. See the end of the article for links to these papers, and related articles on CicadaMania.com. 1 Lee, Y.J. 2016. Description of three new genera, Paratibicen, Gigatibicen, and Ameritibicen, of Cryptotympanini (Hemiptera: Cicadidae) and a key to their species Journal of Asia-Pacific Biodiversity, Volume 9, Issue 4, 1 December 2016, Pages 448–454. Link to Paper. Catalogue of the Cicadoidea by Allen F Sanborn has the complete history of names/synonyms of these species and genera pre 2014. Update (9/20): I guessed the species correctly: all the Large Flute Players. Update (9/24): I neglected to note that there’s another paper out there by Young June Lee called Description of three new genera, Paratibicen, Megatibicen, and Ameritibicen, of Cryptotympanini (Hemiptera: Cicadidae) and a key to their species. Link to it here. This manuscript goes beyond one new genera, and instead introduces three: Paratibicen, Megatibicen, and Ameritibicen. Lee’s paper differs from Sanborn & Heath in that the large Neotibicen are spit into Megatibicen and Ameritibicen in Young’s document, but they’re all Megatibicen in Sanborn & Heath’s paper. Last night I had a rough night’s sleep. I tossed and turned all night long. I remember looking at the clock and seeing 4am, and thinking “tomorrow is ruined”. Sometime during the night I dreamt of finding thousands of molted Neotibicen exuvia clinging to shrubbery — a rare if not impossible sight in real life. When I woke I checked my email and found a communication from David Marshall. David is well known and respected in the cicada world for many things including describing the 7th species of Magicicada with John Cooley (link to document), as well as being part of the team who defined the Neotibicen and Hadoa genera (link to paper)1. David wrote to let me know that Allen F. Sanborn and Maxine S. Heath had published a new paper titled: Megatibicen n. gen., a new North American cicada genus (Hemiptera: Cicadidae: Cicadinae: Cryptotympanini), 2016, Zootaxa Vol 4168, No 3.(link). So, what is MEGATIBICEN? Assumptions after the abstract. The genus Tibicen has had a confusing history (see summary in Boulard and Puissant 2014; Marshall and Hill 2014; Sanborn 2014). Boulard and his colleague (Boulard 1984; 1988; 1997; 2001; 2003; Boulard and Puissant 2013; 2014; 2015) have argued for the suppression of Tibicen and the taxa derivatived from it in favor of Lyristes Horváth. Boulard’s argument for suppression was first described in Melville and Sims (1984) who presented the case for suppression to the International Commission on Zoological Nomenclature with further comments made by Hamilton (1985), Boulard (1985), and Lauterer (1985). A lack of action resulted in additional comments being published in 2014 again supporting the retention (Sanborn 2014; Marshall and Hill 2014) or the suppression (Boulard and Puissant 2014) of Tibicen. My guess, without reading the document, is that Megatibicen includes the larger North America Neotibicen species, including the “auletes group” (N. auletes, N. resh, N. figuratus, N. resonans), the “pronotalis group” (N. pronotalis, N. dealbatus, N. cultriformis) and the “dorsatus group” (N. dorsatus, N. tremulus), or a mix of these. N. auletes is the largest cicada in North America. “Mega” is the Greek word for “very large” or “great”. Word is that Kathy Hill and David Marshall also planned on describing a Megatibicen genus at one point, as well. Whenever cicada names change it causes feelings of bemusement, discontentment and discomfort amongst some cicada researches and fans. I know I don’t like it because I have to update the names of cicadas in 100’s of places on this website ;). Some folks simply disagree with the folks writing the paper. Some people prefer former names because they sound nicer (e.g. N. chloromerus vs N. tibicen tibicen). Some people simply do not like change. Related: Here’s my article on when Neotibicen & Hadoa were established from Tibicen. 1 Hill, et al. Molecular phylogenetics, diversification, and systematics of Tibicen Latreille 1825 and allied cicadas of the tribe Cryptotympanini, with three new genera and emphasis on species from the USA and Canada (Hemiptera: Auchenorrhyncha: Cicadidae) 2015, Zootaxa 3985 (2): 219–251. Note: in the past few years, larger members if the Megatibicen genus were moved into MegatibiceM. The physically larger Megatibicen (formerly Megatibicen) are closely genetically related 1, as well as being physically larger. BugGude.net breaks this group into three categories: “the auletes group” (M. auletes, M. resh, M. resonans, M. figuratus), “the pronotalis group” (M. dealbatus, M. pronotalis, M. cultriformis) and “the dorsatus group” (M. dorsatus, M. tremulus)2. Large Megatibicen cicadas are arranged along the top row in this photo by cicada researcher Kathy Hill. Note the “T.” in their names stands for the older genus name “Tibicen”. Let’s compare them based on their visual and audio characteristics. Photo credits l to r: Paul Krombholz, me (from Bill Reynolds’ collection), Paul Krombholz, Joe GreeM. 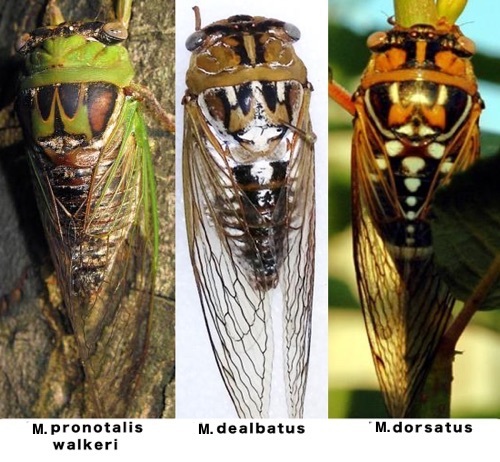 Click the names of the cicadas to listen to their songs, find their geographic range, and to see more images and video. aka Northern Dusk Singing Cicada M. resh, M. resonans, M. figuratus Largest Megatibicen; olive to tan, brown, black & white pruinosity. No distinct markings. Sings at dusk. aka Resh Cicada M. auletes, M. resonans, M. figuratus Smaller green Megatibicen Distinctive resh (ר) markings on mesontum. Its call is like a sped-up, shorter version of M. auletes’ call. aka Southern Resonant/Great Pine Barrens Cicada M. auletes, M. resh, M. figuratus M. figuratus Brown, black & white pruinosity distinctively present within curves of the cruciform elevation Its call is like a bland version of the M. resh call. aka Fall Southeastern Dusk-singing Cicada M. auletes, M. resh, M. resonans M. resonans Brown, black & with pruinosity. Its call has more character than M. figuratus, but is not as sonically impressive as M. auletes. Photo credits l to r: Roy Troutman, me (from Bill Reynolds’ collection), Bill Lesar. Megatibicen dealbatus (Davis, 1915) M. pronotalis walkeri, M. pronotalis pronotalis Orange form looks like M. dorsatus & tremulus, but “stripes” on abdomen of dealbatus are unique. Primarily either orange/rust or pea green, brown, black with heavy pruninosity which forms distinct markings on dorsal side of body. Dorsal side has two black stripes framed by three areas of pruinosity. Megatibicen pronotalis pronotalis Davis, 1938 M. dealbatus, M. pronotalis walkeri M. pronotalis walkeri Tan or pea green, brown, black, and sometimes white pruinose. Wing color matches dominant color of body. Often features a black marking on pronotum3. aka Walker’s Cicada M. dealbatus, M. pronotalis pronotalis M. pronotalis pronotalis Tan or pea green, brown, black, and sometimes white pruinose. Wing color matches dominant color of body. Typically lacks a black marking on its pronotum. aka Grand Western Flood Plain Cicada Orange/rust, black & pruinosity on head & body. Wings are green! Found only in Arizona and New Mexico. aka Bush Cicada or Grand Western or Giant Grassland Cicada M. tremulus M. tremulus, the Orange form of M. dealbatus (although tremulus lacks pruinose “stripes”) Rust/orange, black & white pruinosity, which forms distinct markings, such as a line of white dots down the dorsal side of the abdomeM. aka Bush Cicada M. dorsatus M. dorsatus, the Orange form of M. dealbatus (although tremulus lacks pruinose “stripes”). Rust/orange, black & white pruinosity, which forms distinct markings, such as a line of white dots down the dorsal side of the abdomeM. The pitch of the tremulus’ call is different than dorsatus, which is one way to tell them apart. I will update this page over time to clarify & improve the information. I hope it helps. 1 Molecular phylogenetics, diversification, and systematics of Tibicen Latreille 1825 and allied cicadas of the tribe Cryptotympanini, with three new genera and emphasis on species from the USA and Canada (Hemiptera: Auchenorrhyncha: Cicadidae) by Kathy B. R. Hill, David C. Marshall, Maxwell S. Moulds & Chris Simon. 2015, Zootaxa 3985 (2): 219–251. Link to PDF. 2 Species Megatibicen auletes http://bugguide.net/node/view/6968. East of the 100th Meridian http://insectsingers.com/100th_meridian_cicadas/index.html.